5 ingredients of deliciousness, and super good for you too! Been a while since I've made a creamy chicken dish, but needed some comfort food for this rainy weather we have going here in Vegas. BOMB! 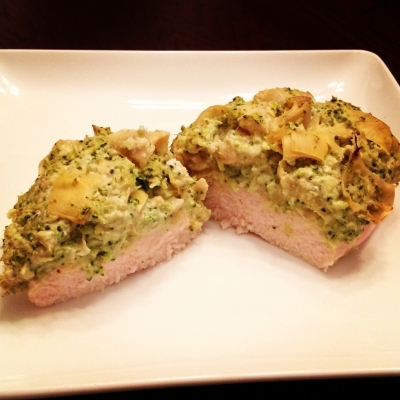 Ingredients (for 2): 2 medium chicken breast, 2 tbsp nonfat plain greek yogurt, 3 tbsp dijon mustard, 5 medium broccoli florets, 1 small jar of artichoke hearts (about 1/4 cup). Directions: "Grind broccoli" in Ninja/express food chopper/food processor, mix with artichoke hearts, greek yogurt, and dijon mustard. Coat top of chicken breasts with the mix (I flattened then out for more surface area). Bake on greased pan on 350 for 16-18 minutes (until top is golden brown and chicken is cooked through.) Easy as that!